So I just upgraded to Mountain Lion, and I'm watching some Netflix over my Apple TV, when it stops streaming and tells me it's not connected to the network any more. Sure enough, my Air has also lost it's network connectivity and the Airport Extreme is solid Amber on the status light. I wait a while, it starts to flash green, then it goes green, and slowly my SSIDs start to appear, and everything is normal again. I presume the AE just rebooted, so I fire up Airport extreme to look at the logs, and remember that in Airport Utility 6.0, all the nice advanced features (and some not so advanced ones) are not available. Amongst them is viewing the logs. So I download 5.6, which is the most recent non-6.0 version that uses the old ways and lets you view logs etc - and it won't install because it's not compatible with Mountain Lion. A bit of googling about also reveals that apparently V6.0 will only manage Wireless-N networks. Seems anyone with older Airport kit, or a need to do anything slightly advanced in ML is screwed. Anyone know how I can either view logs in 6, or install 5.6 on 10.8? If you do not want (or can't) get the app out of a backup you can extract it from the installer. 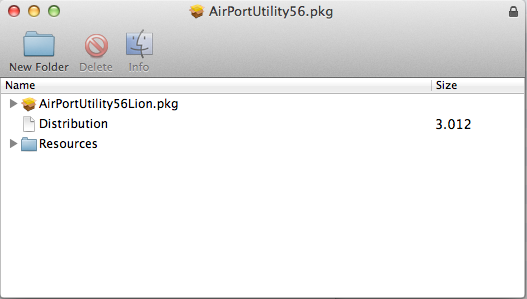 $ gunzip -c < ./AirPortUtility56/AirPortUtility56Lion.pkg/Payload | sudo tar -C / -xvf - "./Applications/Utilities/AirPort Utility 5.6.app"
The app works without issue on Mountain Lion in my limited testing so far. Drag the new version back in, delete the old Distribution and save. I restored version 5.6 from my Time Machine backup of Lion and it works properly, however you should also be able to download it from Apple and extract the application from the .pkg using Pacifist. I use Airport Utilty for Windows on my virtual PC in Vmware Fusion to configure advanced settings. I too was unable to get any of the installers to install any older 5.x version of the utility onto Mountain Lion, but I did copy over AirPort Utility 5.3.3 from a Lion machine and it has been working fine for days to manage some hardware. It is not signed so GateKeeper will prevent you from running it until you go to security preference and allow downloads from anywhere to run. I'll probably set up syslogd forwarding so I don't need to fire up a Lion VM or boot back into Lion for routine diagnostics. This seems like a poor solution since the newer AirPort extremes are not usable even on 5.6 version of the software and I strongly dislike using unsupported software to manage something like a network router. Copy the app to the desktop on your Mountain Lion machine. Copy it to the Applications folder. The end. All the problems arise when you try to REPLACE 6.x. So don't replace it... just install them side-by-side. This way you get the best of both worlds: they both work fine (if you may call anything about 6.x "fine"). Doing it this way does not interfere with updates. And if you need to turn on SNMP just open 6.x and do it. Then close the damned thing and use 5.6 for everything else. After I tried every other solution offered out there, this one finally worked for me: Download Pacifist for Mac. OPEN the package in Pacifist then EXTRACT it to your Applications folder. Then dig down the files until you find the application. Open it and you're good to go. The above will not work with the new Apple Extreme 802.11ac Router & Time Capsule. Apple has decided to eliminate SNMP in the firmware. Not the answer you're looking for? Browse other questions tagged mountain-lion airport-utility . How do I view which devices are connected to my AirPort Extreme using AirPort Utility v6.0? How to preserve DHCP server settings when migrating from Lion Server to Mountain Lion Server? How can I diagnose why I can no longer access certain sites on certain networks since I upgraded to Mountain Lion?